Welcome to Sydney City Signs – the place to visit when you need any type of flag created for your business or service you provide. Custom made flags are one of the best ways to promote or advertise your business or workplace, they stand out in the crowd and they are easily seen by potential customers passing by. Our prices cannot be beaten, we are the cheapest flag and banner manufacturer in the Australia by far, we keep our prices down and our quality up, that how we trade. For up to date prices of our custom made flags, either clink on the ‘custom flags’ link above or call our sales team direct on 0433 000 475 to get the best price possible. When you buy a custom made flag from us you get the complete flag package; which includes the flag made from 100% polyester and inks that don’t run when they get wet, plus a telescopic flag pole and a choice of bases to suit all types of ground surfaces. Over the years we have sold 1500’s of custom flags Sydney to businesses, showrooms and dealerships all over the country, and we have many clients who come back for more. It’s simply because they know we are a very trustworthy corporation and we always provide a service second to none; our products and our prices speak for themselves! At Sydney City Signs our philosophy is simple: choice, value for money and a first class service. We believe in providing our customers with an extensive range of flag and banner products at the best prices with a professional and efficient service on every custom made flag order. 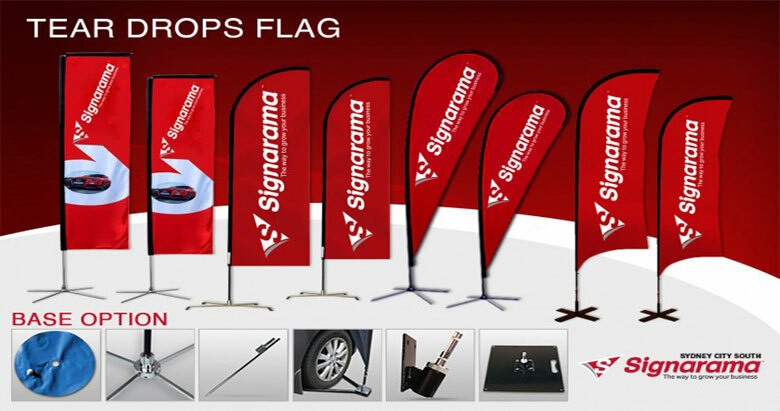 Advertise your business with a custom flag and stand out from the crowd. We are professional flag manufacturers based in Pyrmont NSW. We have the capacity to make both small and large orders very speedily, for example; we can make 12,000 flags in just a few days.